India's Chandrayaan programme is "ambitious"
A moon rush is hotting up, with India, China and Japan devising substantial space exploration programmes to compete with the big players -- the us and European Union. The frantic activity centred on the moon has been triggered off by two us expeditions in 1994 and 1998, which rediscovered the possibility of exploring lunar resources for national advantage. The discovery that earth's only satellite may contain water in some form has only added to this intense interest, holding out, as it does, the possibility of human colonisation. On the positive side, interest in the moon is growing because of the renewed realisation that, as the most accessible celestial body, the moon could be a base for space research to unlock the mysteries of the solar system and provide vital scientific data. Because the possibilities are great, the un prepared a moon treaty, which came into force for ratifying countries in 1984, to impose regulation so that all countries would benefit from this 'common resource'. But the 'moon' nations have consistently blocked any attempt at international regulation of space exploration, especially missions to the moon and other celestial bodies. 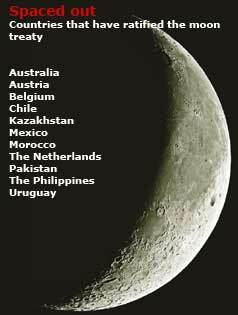 None of the countries with moon programmes have ratified the treaty. The lack of regulation means that non-space countries will not benefit substantially from explorations -- the principal reason for the existing players to jealously defend the status quo. Though, at the moment, there is some degree of collaboration between some countries that have programmes in the pipeline, there is a high possibility that this will turn to competition when the stakes get bigger. For instance, National Aeronautics and Space Administration (nasa) and the European Space Agency (esa) are collaborating with India on its moon programme -- Chandrayaan. The us also has a broader agreement with India on collaboration in space exploration. t v jayan explores the science and politics of the lunar ambitions of India and other countries. Till 1999, India's space programme was focussed on application-driven projects. Sending satellites to space with an eye to immediate benefits. But that didn't mean that space scientists weren't nursing the desire to explore space from more of a pure science perspective. At an annual meeting of the Indian Academy of Sciences (ias) in October 1999, a symposium was organised to discuss moon exploration, says V Adimurthy, whose team is designing the rocket for India's proposed lunar orbiter, Chandrayaan-1, slated to take off by 2008, at the Vikram Sarabhai Space Centre, Thiruvananthapuram. There was widespread support from the scientific community, despite the popular belief that the Apollo and Luna missions of the 1960s and early 1970s had gathered whatever information about the moon was needed. It was felt that an Indian mission would only "reinvent the wheel". "This was a misconception, which got cleared because we could explain the gaps in the knowledge about the moon," says Adimurthy. Three missions in the 1990s -- two sent by the us and one by Japan -- substantiated this. Subsequently, the Indian Space Research Organisation (isro) set up a task force headed by George Joseph, former director of the Space Applications Centre, Ahmedabad. It was asked to prepare a moon mission plan, work out cost estimates, and suggest scientific experiments, taking into account technical resources available within and outside isro . Its report came out in 2001 and two years later the Union government cleared the mission. It is now expected to cost Rs 380 crore (us $88.6 million), the cheapest-ever lunar mission. In comparison, China's Chang'e-1 mission has an estimated cost of us $170 million. The Indian mission got a fillip in May 2006, when it signed a formal agreement with nasa to carry two scientific instruments on the Chandrayaan-1 mission. More significant, was an understanding between the two space agencies on broader collaboration on space exploration, which was being hammered out from June 2004 (see box: Moon men). India's moon mission might be the cheapest ever, but many question whether even this expenditure is justified, especially when existing satellite programmes may need more funds and work to fulfil their potential. isro officials say that one reason for backing the lunar mission is that talented young scientists who join the organisation do not find building and launching rockets and satellites challenging because the template is now in place. To retain them requires offering more challenging tasks. "We can't offer them big money as private sector firms do, but we can certainly offer exciting opportunities," says M Annadurai, project director for Chandrayaan. Planetary sciences have always been a stimulating subject. Venturing into this arena will also attract more bright students, Adimurthy says. G Madhavan Nair, isro chairperson, says the space organisation is not spending much on the lunar mission. "The total money being spent on Chandrayaan-1 is around 2 per cent of the isro budget in the 10th five-year plan." Experts, however, say the problem with these missions is they never stop at one. For making such research missions successful, isro may have to launch several probes, ranging from orbiters to landers, which is going to cost huge sums. But isro officials argue that such cutting-edge scientific endeavours can generate a number of spin-off technologies that can be applied in other areas. For example, a satellite launch requires reliable information about the weather around the launching station. isro has developed automatic weather stations around its launch pad in Sriharikota. This weather station, which automatically downloads and relays data to a central location, can be used for meteorological forecasting. While an imported station costs anything between Rs 10-20 lakh, the one developed by isro is available for Rs 3 lakh. If India were to modernise its weather data collection comprehensively, it might require more than 2,000 such stations, which translates into huge savings, the officials say. Annadurai says path-breaking ventures such as the lunar mission always yield several offshoot products. There are purely scientific issues as well. The two us missions that rekindled interest in lunar exploration were Pentagon's Clementine launched in 1994 and nasa's Lunar Prospector in 1998. They returned with lunar images, which suggested that the polar regions of the moon could have water, a possibility that had remained unexplored during the moon race between the us and the Soviet Union. Photographs also revealed that the earlier understanding of the earth's only natural satellite was limited because almost all landing missions (both the us's Apollo missions and the Soviet Union's Luna exploration) landed closer to the lunar equator region on the near side. Other regions of the moon, particularly the polar regions and those on the far side, seemed to have different chemical and material composition. The possibility of finding water (in the form of ice) in the polar regions has been the trigger for the current rush in lunar exploration, says Annadurai. The presence of water could possibly help colonise the moon, an idea dropped like a hot brick in 1974 as it was found to be an exorbitant proposition. Apart from being available for drinking, water in any form can be split into oxygen for breathing and hydrogen as fuel for rockets as well as land rovers. It can result in substantial cost saving, if permanent human residence is planned. Carrying a litre of water from earth could cost a whopping us $67,000 (about Rs 30 lakh). As a result of the past missions, including several Apollo and Luna landers, a huge amount of data, covering chemical, geophysical and geochronological aspects have been collected. The Apollo and Luna missions had also brought back nearly 380 kg of moon rock and dust, collected from nine different locations in the equatorial regions of the near side of the moon. However, scientists found the data wanting for accurate modelling of the chemical and physical evolution of the moon. The details of these chemical and physical processes, their time scales and the extent to which the moon was subjected to them have not been fully understood. According to Clive R Neal, a geologist at the University of Notre Dame, usa, knowledge about the lunar interior is also close to zero. "This is the biggest gap, in my opinion. We need a long-lived geophysical network (seismometer, heat flow, magnetometer) to better understand the lunar interior," he told Down To Earth . These critical gaps in information spurred several countries to return to the moon. Among the countries that are readying the lunar probes apart from India are China, Japan, the us and the European Union (eu). If schedules hold, spacecraft from India, China and Japan will be moon-bound before nasa 's Lunar Reconnaissance Orbiter swings into action in 2008. Already on duty, the esa's smart -1 is wrapping up survey work. According to Nair, isro has always pursued space science-related activities. The first space launch undertaken by isro was a sounding rocket meant for studying the equatorial electrojet (the large eastward flow of electrical current in the ionosphere that occurs around noon within 5 latitude of both sides of the magnetic equator) and ionosphere. "Besides, the scientific community in India is very enthusiastic about gathering information about the lunar features, particularly the terrain and mineral composition on its own," he added. Nair says the Chandrayaan-1 project offers two challenges. One is technological: designing the mission without outside support. "The farthest we have gone in space is 36,000 km (the Indian communication satellites of the insat family are parked at geosynchronous orbits 36,000 km away). Chandrayaan-1 has to travel 384,000 km," he says. isro also needs to have control over the spacecraft during its planned life of two years. This means further work on orbital control and manoeuvring the probe. isro is currently setting up a deep-space tracking network closer to Bangalore at a cost of Rs 100 crore for command, control and tracking operations for Chandrayaan-1 and other spacecraft India may decide to launch later. Indian scientists have also designed and are building all scientific instruments needed by Chandrayaan-1. "It's a great challenge to build specialised cameras and gauges like spectrometers and altimeters at a scale that is suitable to the moon probe," says Annadurai. He adds that these sophisticated gadgets have to be at least one-tenth the size used in normal satellites because of the much larger distances involved in a lunar mission and the larger costs involved. Besides, the instruments on the orbiter have to be more reliable than those on board remote-sensing satellites, because Chandrayaan-1 won't have any back-up. Chandrayaan-1, which will have a mass of 590 kg when it reaches its destined orbit 100 km above the moon, will carry scientific payloads for chemical, mineralogical and topographic studies of the lunar surface weighing 90 kg. While Indian scientists have designed all the equipment required for meeting the goals of the Indian lunar mission, some is also being acquired from the us, the esa, Germany and Belgium. The main questions that Indian scientists will seek to answer concern the origin and evolution of the moon and whether the polar regions of the moon actually contain water. Scientists have been wondering for long, how the earth acquired such a large satellite, which resembles the composition of the earth's mantle? In the pre-Apollo days, scientists had come up with three principal theories. The theory of co-accretion says the moon and the earth were formed at the same time from the solar nebula (just like some satellites of Jupiter, Saturn and Uranus); fission theory holds that the moon split off from the earth; and the capture hypothesis says the moon formed elsewhere and was subsequently captured by the earth (similar examples are Phobos and Deimos, recently discovered satellites of Mars). Today, analysis of rock samples has ruled out all three. Co-accretion, for instance, was ruled out, says Narendra Bhandari of the Ahmedabad-based Physical Research Laboratory (prl), because the earth and the moon do not have the same bulk composition. Also, a large number of elements found on the surface of both planetary bodies were the same, discounting the possibility that the earth captured the moon. The hypothesis that became widely acceptable was proposed by A G W Cameron, a Harvard astronomer, in 1984. He postulated that there was a collision, or a series of collisions, between the earth and another planetary body about 4.6 billion years ago, leading to the formation of the moon. "The hypothesis resolved the problems of the low density of the moon, the lunar orbit and the high angular momentum of the earth-moon system," says S R Taylor of the Canberra-based Australian National University, the first scientist in the world to analyse the rock samples brought back by the Apollo ii mission. The material in the moon was mostly derived from the mantle of the other planetary body, not from the earth, accounting for compositional differences. According to Bhandari, water can be expected on the moon in spite of its weak gravity, because comets and meteorites containing water have been hitting the moon all through its history. In addition, some juvenile water existing since its formation may still be preserved. Also, solar-wind protons impinging on the moon can reduce the presence of oxides present on the surface of the moon and produce some water molecules. However, even trace amounts of water were not found in lunar rocks and soils. Since the lunar surface has high temperatures (approximately 130C) on the sunlit face and low temperatures on the dark hemisphere (-170C), water and other volatiles are deposited in the cooler hemisphere, the permanently shadowed polar regions. The Lunar Prospector carrying a neutron spectrometer (a sophisticated instrument that detects water even if it constitutes only 0.5 per cent of surface material, by tracking hydrogen atoms in water molecules) found a reduction of warm neutrons around the north and south poles of the moon, which shed a significant part of their thermal energy when they collide with particles of similar size. This could be because of the presence of hydrogen particles in the polar regions. Whether this hydrogen is from water has not been ascertained. Assuming the signal to be entirely due to water, it is estimated that approximately 2x10 9 tonnes of water is spread over 2.2x10 3 sq km and 103 sq km of the south and north poles respectively. This would translate into two trillion litres. According to Annadurai, another objective of Chandrayaan-1 will be to produce a gravity map of the moon. It is known that the moon has one-sixth of the gravity of the earth. Scientists also know that it is not uniformly distributed because it does not have a core with a strong enough gravitational pull and the lunar surface has mounds of iron-rich minerals distorting the magnetic force. "If we have to plan a landing mission or fly closer to the lunar surface in future, we need to have a precise gravity map of the moon worked out," Annadurai says. When Chandrayaan-1 leaves for its lunar orbit, however, it will have company. A moon rush is threatening to seriously crowd lunar space. More than a third of a century has passed since the Apollo Program carried Americans to the moon between 1969 and 1972. While those flights and subsequent unmanned probes have brought back scientific data, they have not come close to answering questions about earth's natural satellite. But the new discoveries have sparked off a moon rush. In 2004, us president George W Bush unveiled a 40-year programme for exploring outer space in which the lunar fantasy was predominant. Called the Earth-Moon-Mars-and-Beyond (emmb) Vision, this ambitious programme looks at the possibility of using the moon as a platform for exploring other planets in the solar system, apart from creating the first human habitat outside the earth. After the break-up of the ussr, Russia has refrained from reaching out for the moon because they don't have money. But China, Japan and India, as we have seen, are actively pursuing moon missions, while the eu, the us's biggest space rival, is debating a human space flight programme. But the eu programme is still to get off the blocks. China made public its plans to explore the moon in November 2000. The plan said the first phase of the programme, consisting primarily of launching orbiters, would be over by 2010. The first of the lot, named Chang'e-1, weighing about 2.6 tonnes, will orbit the moon for at least a year. It will record three-dimensional images of the surface, measure the content and density of the moon's soil, and explore its environment, according to the China National Space Administration. The satellite, which will cost nearly us $170 million, will also probe the space environment between the moon and the earth and measure the solar radiation that incessantly hits the lunar surface. The second phase of the Chinese lunar exploration programme, which should commence by 2010-2012, will be landing missions. According to the official Chinese news agency, Xinhua, researchers in China are currently working on a series of robot probes, which will land and explore the lunar surface. The rovers will have a camera, a telescope and seismological equipment to register quake activity on the moon. The rovers' main purpose will be to help locate a base on the moon. This will be followed by manned flights, exploring the possibility of exploiting precious resources on the lunar surface and possible colonisation. China hopes to become the second nation in the world to put a man on the moon -- by 2018 or 2020. Japan became the third nation after the us and the Soviet Union to explore the moon. In 1990, an earth-orbiting satellite called Hiten carried a small satellite named Hagoromo which was released in the vicinity of the moon. Hiten itself was put into a highly elliptical earth orbit which passed by the moon 10 times during the mission, which ended in April 1993. The Hiten mission was more of a technology demonstration mission for future lunar probes. In recent years, Japan has developed a heavy-lifting rocket that will enable it to conduct its own explorations of the moon, planets and sun. Japan has sent out a spacecraft that passed Mars and another that is on its way to an asteroid. Next, Japan will send two robot-manned missions to the moon -- lunar-a and selene. The Japan Aerospace Exploration Agency is reportedly preparing a long-term space plan that will include constructing a research base on the moon around 2025.
lunar-a's launch has been rescheduled more than once due to technical and financial reasons. It is now slated to take off later this year. The 540-kg craft will use seismometers and heat-flow probes installed in ground penetrators to study the lunar interior. Two penetrators will be deployed on the lunar surface -- one on the nearside of the moon and one on the farside. The nearside penetrator will be located near the old Apollo 12 site or Apollo 14 site, allowing comparisons between lunar-a data and Apollo data. The farside penetrator will be positioned opposite that site on the back of the moon. Each penetrator is expected to penetrate to a depth of one metre to two metres, depending on the hardness of the surface they strike. From that depth in the lunar soil, the penetrators will transmit data on the strength and travel times of deep moonquakes reverberating from the nearside to the farside. That should reveal the size of the moon's core, if it has one. Understanding the properties of the core is necessary to understanding the moon's origins. Data will be stored in a recorder in the penetrator to be transmitted up to the orbiter when it flies over every 15 days. The orbiter then will forward the data to earth. After releasing the penetrators, the orbiter will manoeuvre into a low circular path 200 km above the lunar surface. From there, it will use its 30-m resolution, monochromatic camera to snap shots of the topography on the lunar surface near the terminator. selene, scheduled for launch in 2008, is larger and more complex than lunar-a. It will explore the origin and evolution of the moon, obtain data across the entire lunar surface to find ways of utilising the moon's resources, and develop lunar orbital systems to prepare for the continuous exploration of the moon. selene will consist of three separate satellites -- the main orbiter, a small relay satellite, and a small interferometry astronomy satellite called vrad. The orbiter is a rectangular box of scientific instruments. It is about 7 feet by 14 ft (2.14 m by 4.26 m) and weighs about 3,500 lbs (1,587 kg). This main orbiter will travel around the moon carrying out observations of the surface. The relay satellite is shaped as a small octagonal prism and used to relay communications from the orbiter to earth when the orbiter is out of sight on the far side of the moon. vrad is shaped like the relay satellite and will be used to measure precisely the position, precession and shape of the moon. In January 2004, Bush told nasa to reorganise space exploration according to the emmb vision. The ambitious programme calls for an extension of human presence in the solar system beyond the low earth orbit. As it is planned, it aims to return humans to the moon by 2020 and set foot on a neighbouring planet by the middle of this century. To this, nasa responded with a new model for returning to the moon. Over the next 15 years, it plans to spend us $104 billion for doing this. It plans to make the International Space Station the base to launch 13 passenger and nine cargo missions. According to Hermann Koelle of the Technical University, Berlin, however, the us's programme for permanent (or longer) human presence on the moon will not be sustainable in the present format. It is estimated that a single four-member lunar mission will cost $2.4 billion for a round trip and delivering a 20-tonne cargo will cost us $1.34 billion. Several space scientists in the us have also criticised the programme. Prominent among them is James Van Allen, a space science pioneer. He created ripples when he raised the question about whether human space flight had become an outdated idea in the wake of the Columbia tragedy. He also raised doubts about Bush's grandiose plans for outer space. The risk is high, the cost enormous and the science insignificant, he said. "Does anyone have a good rationale for sending humans into space?" he asked. The debate that followed showed that very little planning has gone into the conceptualisation of the programme. This made Roger Launius, a space historian with Smithsonian Institution, say: "At a fundamental level, I believe this is Apollo ii: The Sequel. Unfortunately, like many sequels in Hollywood it is something of a pale comparison to the original." All these programmes are ambitious, as also the esa's plans, which are still on the drawing board. But the concerns about them are as massive as the ambitions. Perhaps the best way forward is even greater collaboration between nations, even if that does not lead to an international robotic lunar village as the Europeans have proposed. The legal framework governing activities in space in general and on or around the moon in particular has been a matter of great contestation. Collaboration has been the major casualty. The major players in space have jealously guarded their rights over exploration in space and the resources of the moon and other celestial bodies. That is why all the major players in space have either not signed or not ratified the Agreement Governing the Activities of States on the Moon and Other Celestial Bodies, better known as the moon treaty or moon agreement. It was finalised in 1979 and came into force for ratifying parties in 1984 on the lines of the United Nations Convention on the Law of the Sea, which regulates the use of oceanic resources. The agreement turns jurisdiction of all heavenly bodies (including the orbits around such bodies) over to the international community.The legal framework governing activities in space in general and on or around the moon in particular has been a matter of great contestation. Collaboration has been the major casualty. The major players in space have jealously guarded their rights over exploration in space and the resources of the moon and other celestial bodies. That is why all the major players in space have either not signed or not ratified the Agreement Governing the Activities of States on the Moon and Other Celestial Bodies, better known as the moon treaty or moon agreement. It was finalised in 1979 and came into force for ratifying parties in 1984 on the lines of the United Nations Convention on the Law of the Sea, which regulates the use of oceanic resources. The agreement turns jurisdiction of all heavenly bodies (including the orbits around such bodies) over to the international community. Drafted by the United Nations Committee on the Peaceful Uses of Outer Space, it stipulates that all activities on the moon and other celestial bodies in the solar system must conform to provisions that, broadly speaking, try to subject activity in space by individual nations to the control of the international community because space is a common resource of humankind. But the treaty remains a dead letter as a list of countries that have ratified it makes abundantly clear (see box: Spaced out ) and space exploration continues to be governed by the less stringent Treaty on Principles Governing the Activities of States in the Exploration and Use of Outer Space, including the Moon and Other Celestial Bodies, also known as the outer space treaty, which was sponsored, significantly, by the us, the uk and the Soviet Union and came into force in 1967. The outer space treaty did impose some regulation on space exploration, but the most important of these were aimed at keeping space demilitarised, an important concern at the height of the Cold War. Otherwise, it did not impose undue restrictions on space exploration and research. National governments of countries carrying out space explorations were, in fact, made liable and responsible for all missions undertaken by them or organisations within their jurisdiction -- this included responsibility for causing damage. There were areas in which there were provisions for bilateral co-operation within or outside of international forums. But as far as regulation went, it was pretty laissez faire , with a perfunctory injunction to keep the un secretary-general informed about broad details of missions in the interests of international co-operation. Crucially, the treaty said: "Outer space, including the moon and other celestial bodies, shall be free for exploration and use by all States without discrimination of any kind, on a basis of equality and in accordance with international law, and there shall be free access to all areas of celestial bodies." Given national capabilities for space research then and now, it is obvious in whose favour the treaty loaded the dice. The outer space treaty offers other benefits. For instance, though it says celestial bodies are "the common province of all mankind", the treaty only says countries cannot claim outer space or other celestial bodies as colonies. It permits the use of their resources, even if that is only through silence. The countries that are planning lunar missions in the coming years, even though they haven't spelt out their plans out clearly, have it in their agenda to explore the possibility of exploiting valuable minerals and chemicals that may be found on the moon. One such material, often talked about, is helium-3, a radioactive isotope of the gas helium. Embedded widely in the lunar dust over almost 4 billion years, helium-3 is possible material for future nuclear fusion reactors, which are expected to use technologies that are environmentally benign. Helium-3 reaches the moon as a component of solar wind along with hydrogen, ordinary helium, carbon and nitrogen. Former Apollo astronaut, Harrison H Schmitt, writes in a recent book, Return to the Moon, that 2 sq km of lunar surface contains about 100 kg of helium-3 to a depth of 3 metres. This is enough to provide 1,000 mw of power for a year. One tonne of helium-3 can supply 10 million mw, one-sixth of uk's requirement for one year.  Requires all resource extraction and allocation to be made by an international regime. The major space players, which reserve their rights to return to the moon for human colonisation and exploitation of lunar minerals, object to the "common heritage of all mankind" clause of the treaty, says S R Bhat, chair of space law at the Jawaharlal Nehru University in Delhi (see p50). This clause specifies that all resources in space belong equally to all nations. The use or extraction of such resources by one nation is, therefore, against this treaty. 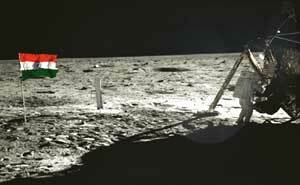 Legal experts working closely with the us government had also objected to a clause in the moon treaty that stipulates "equitable sharing of lunar resources", saying it was similar to a clause in the law of the sea treaty that laid down that an international authority will govern and conduct all resource extraction, with a hefty share of the proceeds going to less-developed countries regardless of whether they have any investment in the activity or not. The us establishment argued that this would discourage -- if not prevent --development of lunar resources. Also, the moon treaty, like the Antarctic treaty, sought to limit the use of the moon to scientific purposes, clearly prohibiting space tourism and other non-scientific uses, which hasn't gone down well.